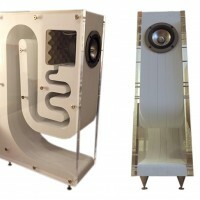 Each base cabinet utilizes one 15″ Dayton series II woofer in a 5 cu. ft ported box. I used a 10″ (actually 11″ because its flared) Aeroport for the port. For the crossover I used an 18 gauge 10 mH I-core inductors to yield a 6db crossover point of about 120 Hz. I wired the drivers in reverse polarity, mostly because they sound better like that. The top section of the boxes, which are a completely separate box sitting on top of the woofer cabinet, house four Dayton 295-300 5.25″ midranges wired in series parallel network yielding an 8 ohm load. I used a 4″ port 4″ long in the top cabinets. For the tweeter I used a Morel MDT-30, except in the center channel which utilizes a Morel DMS-30. * Part 277-082 replaces the original items due to availability. 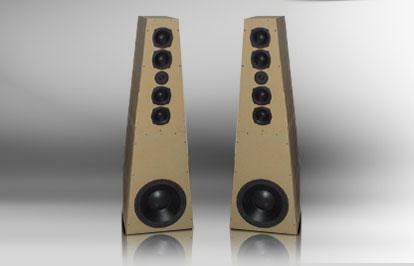 Parts Express has paid special attention towards maintaining the integrity of the original speaker design. The top cabinets are a little more than 2.5 cu. ft. in volume and built in a trapezoidal shape. I used 1″ thick super refined fiberboard. It is quite expensive but not too bad to work with, and is really good stuff! The cabinets are designed using a 5.7 degree taper and to not have any parallel sides, except top and the bottom. 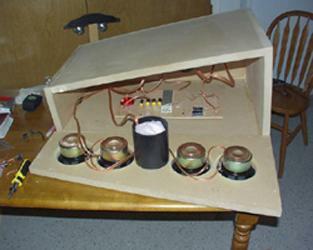 This design insures standing waves in the box are kept to a minimum. The front baffle of the lower cabinet is sloped, and the rear is not. The front baffle to the top cabinet is not sloped, while the rear baffle is. The overall outer dimensions of the cabinets are 24″ deep, 20″ wide at the base of the lower cabinet, and 21″ deep and 14″ wide at the top. The lower cabinet is 30″ high. The top cabinet is also 30″ high, but 14″ wide and 21″ deep at the base, and 8″ wide and 18″ deep at the top. I used liquid nails and wood screws to hold the boxes together, and silicone to seal the joints. EQUIPMENT USED I have a Sears plunge router and a Jasper 200 jig to cut all the holes. To do the angles I used a portable table saw, and to cut the wood a Skil saw. It is not the best of equipment, but every piece fit pretty well, and what didn’t, I trimming up with a vibrating sander. I will eventually paint them, and hopefully get a nice finish. The crossovers in the top cabinet are in two separate pieces. 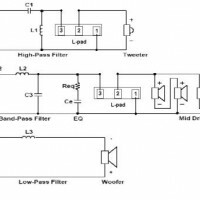 The tweeter crossover uses a Linkwitz Riley crossover crossed at 2350hz. The components are a 1.1mH 18gauge inductor and a 2.7 + 1.5uF 250v Dayton metallized polypropylene capacitors wired in parallel to yield 4.2uF. The tweeter has a variable l-pad. The mid crossover is slightly more complicated. It has a 171uF capacitor (100uF 100v + 68uF 100v + 3uF 250v) 6db high pass to yield a crosspoint at around 115-120 hz. 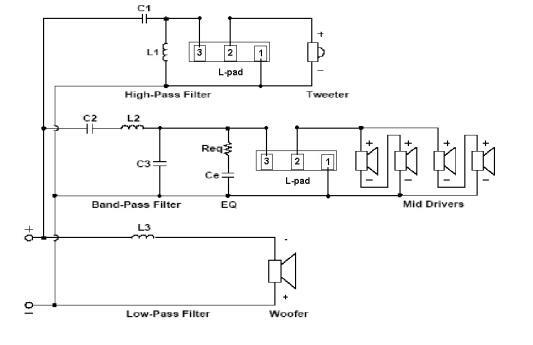 The low pass section has a 1.1mH inductor (same as above) plus a 4.2uF cap same as above. 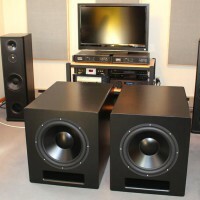 I used a parallel zobel network on the midrange speakers. The component values are 8 ohm + 6uF (3uF + 3 uF 250v). 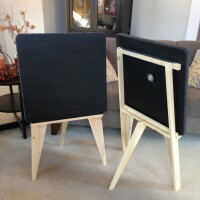 The midrange speakers are wired using a variable L-pad. Both the variable L-pads are 100 watts mono 1″ shaft models. 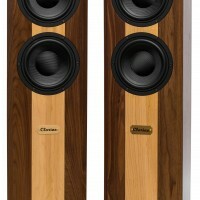 The components in the center channel are essentially the same as the top cabinets of the main speakers but the cabinets are designed without tapers. It has about the same internal volume as the mains. The outer dimensions are 30″ wide, 24″ deep and 9″ high. I utilized a zobel crossover network with a “hair” more rolloff (8ohm 8.2uF) on the midranges, 1.1 mH and 4.3uF Solen caps for the two way. 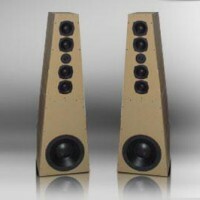 This cabinet also utilizes two L-pads, one for the mids and one for the tweeters. 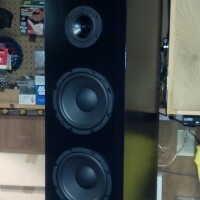 The bass extension is quite impressive for a center channel. I used a rear firing port tube 4″ diameter flared, 4″ long. In this cabinet I used Morel DMS-30 tweeters and the mids are the same as the mains. My name is Matthew K. Olson and I am currently 21 years old. Next fall, (fall ’01) I’ll be attending UCONN Dental School as a freshman. I play trumpet and piano, piano being my principle instrument but my most neglected instrument the past couple of years at college. 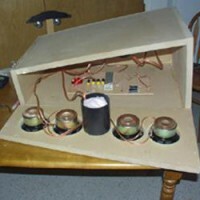 I am an avid speakerbuilder and have been since I was around 13 years old. My projects have been getting bigger and better as time goes on. I tend to build and then sell so I can retain my budget and refine my designs. I don’t have any sophisticated equipment yet, so I mostly build by ear and by getting lots of advice from the PE message boards. Thanks guys!! I also like to play on the computer, hang out with friends, and spend lots of time with my fiance. We’ll be married June ’02. 🙂 I am currently a biology major at LeTourneau University in Longview, TX and will be moving back to CT May ’01 following graduation. I suppose thats it for me! Any and all questions are always welcome! !